After a busy few months of heavy duty writing, it looks like we are getting close to the final stages of our Beginning SharePoint 2010: Building Team Solutions with SharePoint book. This book is a continuation of the book we had written for 2007 with a few additional topics that were not included in the 2007 version such as Governance, Records Management, Social Networking, and Branding. 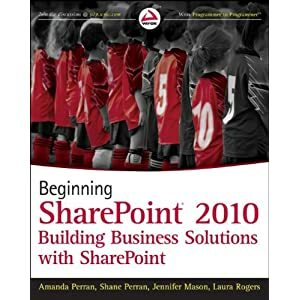 We are also joined on this book by two great ladies in the SharePoint world, Jennifer Mason and Laura Rogers. These guys bring great insight to our book and we are thrilled to have them onboard for this project. Is this a book on SharePoint Development or for End Users? I get this question a lot. Officially we state that this book is ideal for anyone getting started with SharePoint as it will bring you end to end on the various features and functionilty that are available out of the box in SharePoint. Our goal is to teach the readers how to use and configure the various settings to build an environment that matches their business needs. So in my opinion if you have been given the keys to SharePoint in your organization and are responsible for configuring it to meet your needs, then our book will be perfect for you. Now if you are developer, I still think you should read this book because its critical that you understand what SharePoint provides from a features and functionality point of view before you crack open Visual Studio and decide to build everything from scratch yourself. Having a solid understanding of what the platform provides is your first step to becoming a solid SharePoint developer as you need to understand where the logical points of extension are. Sadly I have come across too many situations in my consultant life where a developer or set of developers have custom built items that existed in SharePoint out of the box simply because they were not aware the feature even existed. In 2007 dialog boxes often inherited backgrounds that you had not anticipated, or wanted. It seems 2010 has a much simpler fix to work around this. Adding the class: .s4-notdlg should force the background not to show in dialog windows. I noticed Randy and Heather both posted on the topic already so no need to get any more in depth than this here. I have the honor of presenting in 2 weeks time at the SharePoint Evolution Conference in London, England. The conference is a biggie for anyone interested in SharePoint 2010 as the content is 100% focused on the new release which will be launched just a month after the conference on May 12th. This 3 day SharePoint 2010 Evolution Conference, consists of over 70 Sessions dedicated to IT Pro’s/Developers/Designers/Information Workers/Business Adoption and Power Users and with a new Deep Dive 400 track and 5th Power User Track added this is set to be Europe’s Premier SharePoint Conference for 2010! Born from the very successful Best Practices conference in 2009 hailed by many as the best SharePoint conference ever. Sessions list second to none, speaker list second to none. 55 Expert SharePoint speakers from Microsoft and well known companies. Never before has such a group of talented speakers like this been brought together. Since SharePoint was introduced nearly a decade ago, many organizations have embraced the tool as a mechanism to adopt better document management practices. While the platform provides features and functionality to support effective document management and collaboration, without proper planning and governance, many organizations fail at recognizing the true potential of what SharePoint can offer. Creating an effective and reusable classification plan using the new and improved tools in SharePoint 2010 that optimizes stakeholders ability to find the right document at the right time. Designing taxonomies and hierarchies to support business goals for collaboration while also ensuring maximum performance and security. Implementing document content types in a way that allows for more effective and governed document management, without adversely impacting how users like to work. Managing the document lifecycle from creation to expiration. This will be my first trip to the UK and I am pretty excited about it. If you are going to be there. Drop me a line via comments or my About Me page to let me know.